Your favorite deli might use 10,000 pieces of petroleum-based plastic ware a week. Your local ballpark will go through 50,000 in a single day. 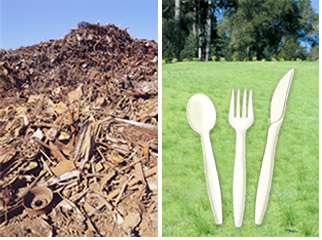 Picture the mountains of petroleum-based plastic spoons, forks and knives that go straight to the landfill every single day, in every single community around the country. Our mission is to be part of the solution. We're focused on helping to reduce waste by developing and marketing sustainable solutions  compostable, recyclable and reusable products for households, businesses, and institutions. Earthware Biodegradables. Be part of the solution. This site is protected by www.LetterDash.co, the demand letter platform. official letter from our attorneys via LetterDashâ„¢.